Double Stitch Blue Jeans by Pascucci. Double stitch blue jeans are on every trendsetter’s must-have list. 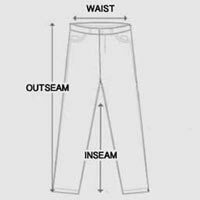 Pascucci Jeans guarantee quality treated jeans with durability. Features a standout white and beige double stitching along hemlines. Double stitch blue jeans constructed with button up fly and front and back pockets. Thigh wrinkling and faded hue creates a stylishly worn-in feel. Classic blue shade is a versatile color that can be easily styled for day to night looks. Choose the double stitch blue jeans for anything but average denim. Model is wearing size 30. For accurate measurements, check the table below.